Looking Back On My New Year’s Eve, Stupid Decisions & Stability. The Hidden Masquerades & Mutuality. Two Introverts Sitting In A Tree. THE SICK TWISTEDNESS OF REALITY. The Skepticism of Auto-pathography. The Unreliable Narrator. The Quiet Introspection Of One’s Life: A Short Discourse On The Dualities Of Our Realities. Depression Is The New ‘Black’. Alice & Her Attempt At Leaving Wonderland. Bipolar Isn’t All Black Drapes & Cobwebs, But Winter Is Coming. Rocking The Pit Of Despair. How Deep Is The Rabbit Hole? Fornicating On The Altar Of My Own Self-Grandiosity. Let It Burn. The Idealistic And Miserable Ravings Of A Self-Professed ‘Mad*’ Woman. Mania Of The Past Through The Lens Of The Present. Happiness Isn’t Our ‘Natural’ State Of Mind. Is Mania A Defense Against Depression? Mr Lamictal, How Lovely You Are. I Have A New Man In My Life. His Name Is Chandler. Pet Assisted Therapy. Setting The Fox to Guard The Hen House. The Blind Leading The Blind. Psychiatry’s Grand Confession. New Research On The Aetiology Of Bipolar Disorder. The Blame Game: Antidepressants Cause Bipolar Disorder?! Is Early Onset Bipolar Disorder a Myth? An Attempt At Being Truthful About Suicide & Media Correlations. Does The Term ‘Manic Pixie Dream Girl’ Allow Sexism To Be Better Perceived? The Highly Functioning Abnormally Normal, Normal Person. The Sobriety Of My Mind. Playing Devil’s Advocate With Key Religious Figures And Mental Illness Correlations. Disclaimer: Not my own thoughts, the research is from the Journal of Neuropsychiatry – The Role of Psychotic Disorders in Religious History Considered. This blog entry is me playing devil’s advocate to provoke debate; I’m not in any way trying to undermine a person’s religious beliefs, simply trying to encourage discourse underlying subconscious preconceptions of mental illness within religion. -Why would it be so bad if the inspirational figures in religious history experienced mental illness? -Why do we subconsciously reject the thought that God wouldn’t work through people who have mental illnesses? -Does being mentally ill make you exempt from God’s work and unable to meaningfully participate in worship when one in four people have been statistically proven to suffer from mental illness at some point in their lives. The awkward moment when it becomes plausible that Jesus suffered from Schizophrenia (Just to clarify: this wouldn’t in anyway take away from his religious position, history and achievements). A study was conducted by psychiatrists when they were presented with a concept by a paranoid schizophrenic patient, who claimed that he could read minds and was selected by God to provide guidance for mankind. The patient refused to take the medication because they stopped the voices, presenting his doctors with the question: “How do you know the voices aren’t real…How do you know I am not The Messiah…God and angels talked to people in the Bible”. The patient raised interesting questions, how does one distinguish between people with mental health disorders and those of religious figures in history? Within the New Testament Jesus exhibits behaviours that closely resemble the DSM-IV-TR– Auditory hallucinations, Visual Hallucinations, delusions, referential thinking, paranoid-type, (PS subtype) thought content, and hyper-religiosity. Through the text Jesus also displays signs of disorganization, negative psychiatric symptoms, cognitive impairment, or debilitating mood disorder symptoms. The article poses the question about whether starvation and metabolic derangements caused some of the behaviours as Jesus experienced hallucinatory-like visions whilst he fasted for 40days in the desert (Luke 4:1–13). Jesus’ experiences appear to have occurred over the course of at least the year before his death. 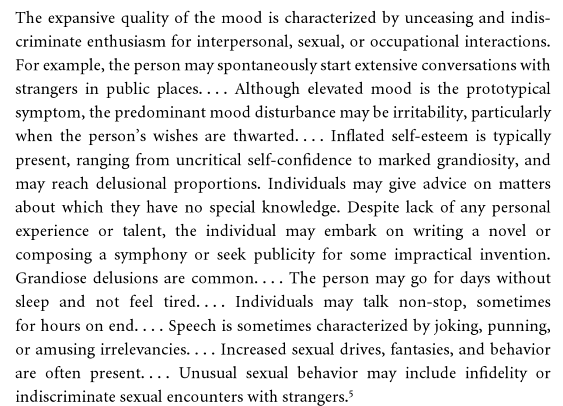 There is a notable lack of physical maladies which suggest psychiatric aetiologies as more plausible. There is a 5%–10% lifetime risk of suicide in persons with schizophrenia. Suicide is defined as a self-inflicted death that has intention to end one’s life. The New Testament recounts that Jesus was aware that people intended to kill him. Jesus took the steps to ensure that his followers were aware that his death was necessary for his return (Matthew 16:21–28; Mark 8:31; John 16:16–28). These passages appear to present Jesus to deliberately place himself in a situation wherein he anticipated his execution. Schizophrenia is often associated with increased risk of suicide. There is a term called ‘suicide-by-proxy’, any incident whereby a suicidal individual causes their own death to be carried out by another person. Jesus’ behaviour before his death has parallels with someone who premeditates a form of suicide-by-proxy. In the passage Mark 3: 21: Jesus was on occasion viewed as mad or “beside himself.” People from Jesus’ hometown and the religious authorities of the day also did not accept his message. Subsets of individuals who have psychotic symptoms appear to be able to form intense social bonds and communities, despite having distorted views of reality. The study analysed the religious figures from a behavioural, neurologic, and neuropsychiatric perspective. The research indicates that the experiences of the individuals coincide with psychotic symptoms, suggesting that manifestations of their experiences had a primary or mood disorder-associated psychotic disorder basis. A main goal of this research was to evaluate the influence of individuals with mental illness and their effects on shaping the Western civilization, hoping that the findings will help to increase compassion and understanding in relation to mental illness. Within the research it should be noted that they did use explicit passages from the bible, but each passage should be examined in its own context. It is generally acknowledged that biblical scholars are not unanimous about the literality of the scriptures nor are psychiatrists completely unanimous about the DSM (basically the bible of psychiatry). The research conducted a form of psychological profiling by people that aren’t saddled with the preconceived notions and biases that encumber those that have studied their field in depth, allowing a fresh take on ideas that have been overanalysed by people in the same area of study. Only by joining multiple areas of study can any true concept of history be interpreted, attempting to remove the elitist theories that dominate popular thought. It needs to also be acknowledged that historians aren’t the sole area of study that can interpret history, other fields of study have valuable insights that historians can lack. The article didn’t stipulate and designate that religion was the cause for psychological symptoms, neither did it go into the scientific explanation, but it still needs to be acknowledged that religion does play a dominating role for some psychoses, especially with delusions. Does the motivating factor of religion in mental illness make it a definable feature?? I’m increasingly intrigued by the article when it encourages speculation on our inability to disprove that a person who is schizophrenic is a mouthpiece of God or is suffering from psychoses. The opposing opinions from both sides need to be taken into consideration; biases from long term studies ultimately detract from the viability of the research. The study showed the correlations that religious historical figures had with the current DSM, they acknowledged their limitations, like either psychological or biblical should do, my main question is this: why would it be wrong if they had suffered from a mental illness, it doesn’t detract from their accomplishments or their religious foundations, each person’s beliefs will always be grounded, who’s to say that God didn’t use psychoses to achieve his end. I didn’t want to post this all week, didn’t want to ruffle anyone’s feathers. I came across this article, it really interested me, I understand its controversial, I am in no way promoting and detracting from either side and hope my post won’t be interpreted as such. Thank you. From the Dept. of Neurology, McLean Hospital, Harvard Medical School, Belmont, MA (EDM, BHP); Dept. of Psychiatry, McLean Hospital, Harvard Medical School, Belmont, MA (MGC); Dept. of Neurology, Massachusetts General Hospital, Harvard Medical School, Belmont, MA (EDM, BHP). Murray, E., Cunningham, M. and Price, B. (2012). The Role of Psychotic Disorders in Religious History Considered. JNP, 24(4), pp.410-426. Icarus needed to escape from Crete, constructing wings to fly to safety, the wings were made of feathers and wax. 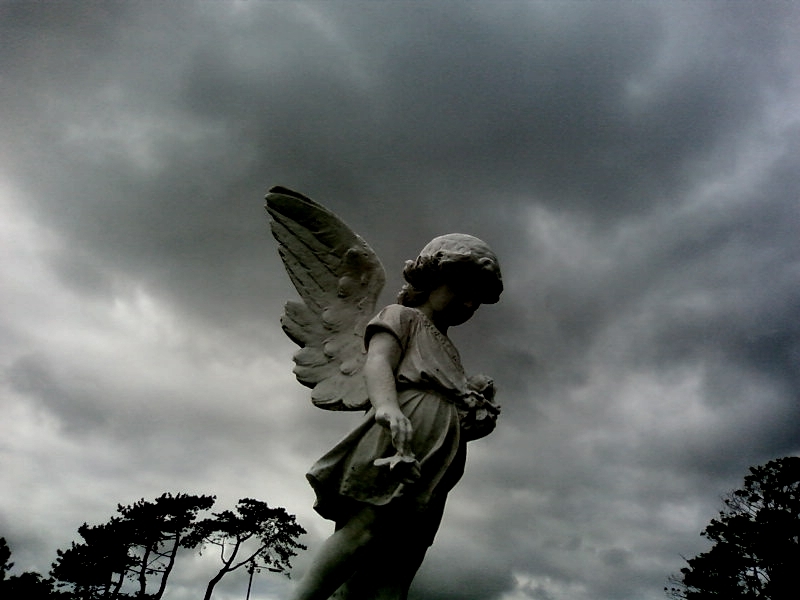 He was warned not to fly to low lest his wings get wet and not too high lest the sun melts the wax. The young Icarus was thrilled by the flight, but did not heed the warnings; he flew too close to the sun, at which point the wax melted and he fell into the sea. 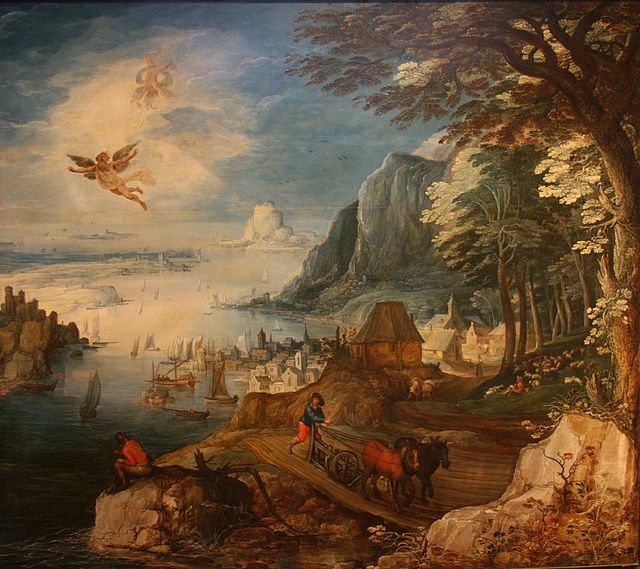 The fall of Icarus becomes a cautionary tale to understand the value of moderation. Henry Murray first coined the term ‘Icarus complex’, later the complex has been associated to mania, whereby a person exhibits grandiosity or narcissistic inclinations and a fascination for heights. The tale of Icarus is to take the middle way, cautioning against the heedless pursuit of instant gratification. The concept of the Icarus complex reveals that when the gap between the idealised goal and reality is great, there is a greater chance that the endeavour will end in failure. Icarus represents the sin of hubris, which can be interpreted through biblical texts which state that pride goes before a fall. 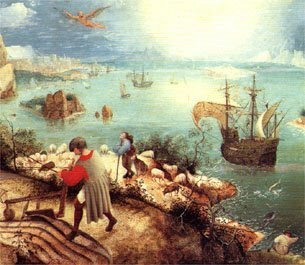 Imagery of Icarus shows him smiling as he descends as his father watches in horror, the painting illustrates that life goes on, the plight of Icarus is irrelevant, the farmer will continue to plough and the ship captain will continue on his voyage without a care as Icarus drowns in the water. The image of Icarus conveys the joy in flight, the value in his triumph, no matter how short-lived. The complex associated with Icarus conveys the pendulous emotional polarities, mania is exhibited by flying too high, whereby he got “burned”, followed closely by his inevitable emotional crash that followed his flight of mania into depression – drowning in the ‘sea’ of depression. It can be argued that mania can therefore be interpreted as a form of ambition, an excessive ambition that ends in disaster. Another interpretation of Icarus regards his pursuit of enlightenment by transcending the Earth, this suggests grandiosity. The story of Icarus also embodies every humans potential to have differing levels of manic-depressive states, our moods fluctuating. The psychoanalysis of Icarus suggests that he was in a manic state, dominated by hyperactivity and euphoria. Icarus’ state of mind remaining unchecked, progressively losing his sense of reality and oblivious to the potentially fatal risk associated with his flight. His grandiose belief and overestimation of his personal capabilities allow a never ending energy and illusion to drive him onwards. “It is not a matter of indifference whether one calls something a ‘mania’ or a ‘god’. To serve a mania is detestable and undignified, but to serve a god is full of meaning.” C. G. Jung. Don’t let the title scare you away, it’s a mouthful, and yes, yes I am crazy. Normality in society has become this unachievable baseline. I believe that everyone experiences some form of abnormal psychological thought processes at one stage or another in their life. Apparently being abnormal was to demonstrate a significant deviation from accepted behaviour, emotion or thought patterns. The concept of normality is based on a sense of ‘wellbeing’, how is this a completely achievable state of being? No one is completely well all their life, our state of mind always shifting depending on the circumstance. Does having bipolar disorder make me abnormal? In my opinion no, I perceive it as my ‘normal’ state of mind, I function on a day-to-day basis quite well, better than most actually, I receive high grades at university, work full time and participate actively in social circles, yet my ‘disorder’ by societies standards would make me ‘abnormal’. The perception of normal is dependent on societal standards of the time which vary by person, time, place, culture, and situation. Normality is self-perceived and regulated by each individual, the individuality of normalcy makes everyone abnormal. OK, my actual point was to look at the fact that society doesn’t automatically correlate geniuses who have a mental illness with being abnormal, as long as their creative works eclipse their madness. This double-standard contradicts society’s perception of normality. In some instances these highly dysfunctional yet creative types aren’t given negative stigmas, the population preferring to believe that ‘anyone’ can be that creative without a mental illness or an abnormal perspective. For me it has become infuriating that people are blissfully unaware that so many of the world’s creative types and leaders suffered or suffer from mental illness. How do so many people with a mental illness become the leaders of so many people? I’ve started to believe that maybe they needed that extra push or mentally different mindset to get where they are. The people I’m talking about are Marilyn Monroe, Florence Nightingale, Edgar Allan Poe, Joan of Arc, Jackson Pollock, Russell Brand, Frank Sinatra, Brittany spears, Catherine Zeta-Jones, Adolf Hitler, Chris Brown, Abraham Lincoln, Beethoven, Michelangelo, Charles Dickens, Charles Darwin, Winston Churchhill, Isaac Newton, Thomas Jefferson, Einstein, DaVinci and Napoléon Bonaparte (to name a few). These forward thinkers and creative types of people suffered from a form of mental illness, so how do we judge ‘normalcy’ in society when we follow the ‘abnormal’ people? It seems that society overlooks the connection that a lot of literature pertaining to history’s brilliant minds is disregarded in its relationship to potential psychoses. Socrates believed that a mental illness gives an already talented individual an edge. Everyone is located at a point on the mental health spectrum, mental health seen as a continuum, there is an association between the higher end of the spectrum and the capacity for a person to have an original thought. In Plato’sPhaedrus, Socrates’ second speech he asks “If a man comes to the door of poetry untouched by the madness of the muses, believing that technique alone will make him a good poet, he and his sane compositions never reach perfection, but are utterly eclipsed by the inspired madman”. Cesare Lombroso – Theorised that a man of genius was essentially a degenerate whose madness was a form of evolutionary compensation for excessive intellectual development. Neil Cole (psychiatrist) – “the word associations, puns, flight of ideas, that are an intrinsic part of bipolar disorder in its manic phase, and the reflective thoughts, ruminations and the stripping of life away to the bare essentials that are experienced during the depressive phase, in my view, considerably enhance the artist’s armoury of ideas”. Believing that the ‘genius’ factor hinges on eccentricity. Mental illnesses can be incredibly destructive; it has to be considered that without obsessive research habits, extreme moods and neurotic drives we wouldn’t have a lot of our scientific knowledge, art and literature. 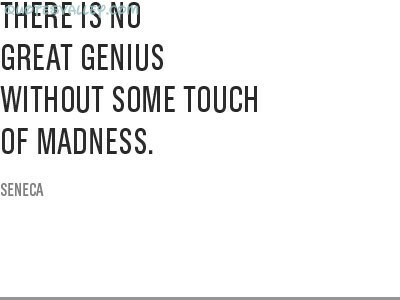 Although not all people with a mental illness are geniuses likewise not all geniuses have a mental illness. Parting note: Society is extremely hypocritical of mental illness, not stigmatizing it when it becomes beneficial and not classifying it as abnormal. How can we then make clear-cut definitions of being abnormal and normal when it is dependent on the contributions of the person afflicted. You can’t in any whole capacity understand the mania of the past through the lens of the present. What was originally termed ‘mania’ in the past currently exhibits little resemblance to the ‘mania’ experienced by people with bipolar disorder. Mania has always existed as a form of madness, in contemporary psychiatry ‘mania’ signifies as an episode or as a pole on the affective spectrum. There is a strong need to transform the image of madness, re-framing mental illness as a positive, at least the hypomanic edge that it correlates with. When you’re truly manic the repercussions of your actions never gain much thought, there is a certain amount of ‘glamour’ attached to mania, a sheen that creates easy oblivious actions which have little association to your ‘normal’ train of thought. The bliss of oblivion. Many people would prefer to be the manic sprite instead of the depressive shade that haunts their homes when darkness encroaches. There are no romantic notions towards depression for those who experience it recurrently; depression is a beast that slowly eats away all the feelings inside, leaving you numb and vulnerable. The clinical terms used to categorise bipolar disorder act like an oversized ad-campaign sign on a main road that reads ‘manic-depressive’. It feels like an endless resistance to the labels, the labels becoming the straightjacket of mental illness, restrictive and confining. Go Away Anxiety, You Have No Friends. Euphoric or Dysphoric? Ramblings… I’m Probably Nuts. The ‘Poster Patient’ of Bipolar Disorder. The Morning After I Killed Myself, I Woke Up. People Are Strange. Wine Is Better. Three Months of Freedom. I’m Back. “We Were Born Sick, You Heard Them Say It”. My New Meditation Crutch, The Surprise Attack Of Psycho Girlfriend Syndrome.